From retaining heat in a typical warehouse to maintaining air quality in a cleanroom, HART DOOR SYSTEMS says its Speedor range of automatic, high speed, industrial doors continues to show its huge scope of use in industrial and warehouse applications. Hart is a leading designer and manufacturer of industrial doors systems with its high-speed door ‘Speedor’ now a globally recognised brand. In all there are five types of Speedor in addition to the ‘Super’ variant. 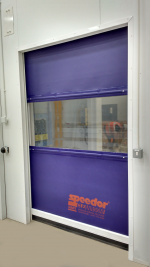 Hart says Speedor Storm offers exceptional wind resistance, Speedor Mini is for internal applications, Speedor Maxi utilises twin layer fabric for large door openings, Speedor Conveyor is for high frequency conveyor systems and Speedor Twinblade has been designed to meet specific air leakage rates.